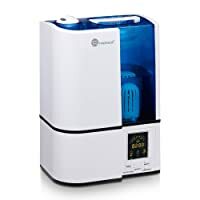 TaoTronics TT-AH001 is one of the best humidifier for baby on the market, and this is not only according to its manufacturer but also a majority of its users. It is one of the few machines that will never disappoint you due to its features and performance. It has a lovely LED for easy control and monitoring of humidity level and a 360-degree nozzle that lets you direct the mist where you wish. 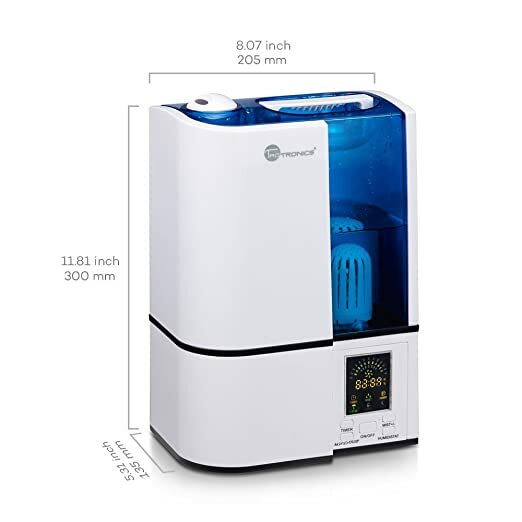 TaoTronics TT-AH001 is one of the best humidifier for baby on the market, and this is not only according to its manufacturer but also a majority of its users. It is one of the few machines that will never disappoint you due to its features and performance. It has a lovely LED for easy control and monitoring of humidity level and a 360-degree nozzle that lets you direct the mist where you wish. The microporous ceramic cartridge gets rid of harmful agents in the water and also makes it an eco-friendly product. Apart from this it also has a 4-liter tank that gives it the capability to operate for up to 15 hours without having to refill, and it has an auto shut off feature to switch it off when the water level is low. The built in time and sleep mode are also a few extras that make it a perfect humidifier. Microporous Cartridge: This particular type of cartridge will filter microorganisms, magnesium and calcium ions from the water and hence ensuring that your baby gets a beneficial mist. Controllable Humidity: The freedom to set the level of humidity level and control mist is very beneficial since it will help you personalize the humidifier to fit your personal requirements. Tank Capacity: You will never have to worry about refilling it since the large four litter tank will work continuously for up to 15 hours. LED Display: The LED shows you the level of humidity and a few other modes operation. This display not only makes it easy to control the humidifier but also gives it a modern appearance. 360 Degree Nozzle: The nozzle is one of the things that will let you control the mist since you can direct it anyhow you wish. This machine also has the option to choose between low, middle and a high setting. Built-In Timer: This feature allows you to set the humidity level on for anything between one and 24 hours. Bright and clear LED display makes it easy to operate. The nozzle is rotatable for 360 degrees and hence giving you the freedom to direct the mist where you wish. It comes with a very convenient inbuilt timer. 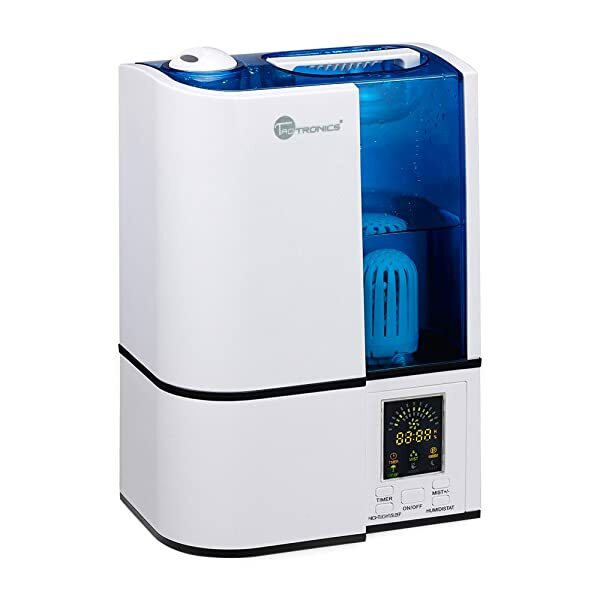 Although it is a small machine, it can humidify rooms that are up to 538 square feet. TT-AH001 is a zero noise machine. The large 4-liter tank capacity can work for up to15 hours continuously. The water will spill if you are not careful when adding it to the reservoir. Bubbling of the water sounds as if it is dripping from the tank to another compartment and this can be very disturbing. Although the output is right, it could do with some improvements to keep up with cold winters. Several things make the Taotronics TT-AH001 a great machine with the principal among them being the large tank capacity, 360-degree rotating nozzle and the built in timer. However, what sets it apart from others in the market is that it works as advertised and hence meaning that you get value for your money. Its few disadvantages are minor things that will not affect its performance in any way. And so if you are tired of all the negative things that come with dry air this is the machine that you need to buy.